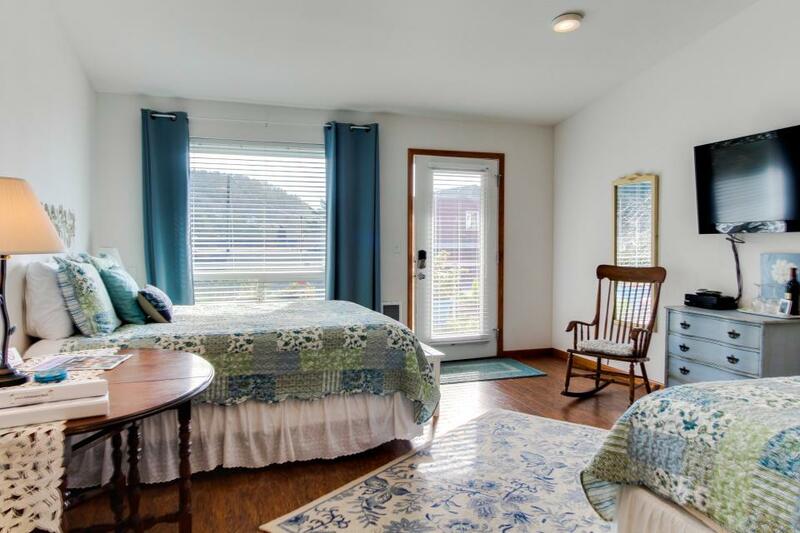 The Tidewater Room has two queen beds with side tables, a Queen Anne-style recliner, a vintage Canadian maple rocking chair, a dresser, a dropleaf table, and a chair. The palette of soft blues and creams complements the shabby chic feel. The Tidewater Room is located in our Lower Building, which is nestled between the Upper Building and Whale Park, a tiny public park that is home to a one-of-a-kind whale art sculpture. The Tidewater Room faces Whale Park, with views of the ocean to the right. Outdoor seating is available in front of and on the east side of the Lower Building.